Most WI winter wheat growers dodged the Fusarium head blight (FHB or scab) bullet in 2016; though many farmers especially those in SW WI became so disgusted with dockage and rejections in both 2014 and 2015 they didn’t plant a single acre this year. Therefore as we prepare to put the 2017 wheat crop into the ground here are a few considerations for managing FHB before we drop a single seed. Crop rotation matters. Data from our long-term rotation studies indicate that wheat following soybean provides the greatest yields. The next best options are wheat following corn silage (6.5% less) then corn for grain (21% less). Wheat following alfalfa or another leguminous crop are also good options, though the N credits following alfalfa may best be served going to corn. Furthermore, background fungal pressure (residue on and in soil) from the FHB fungus will be greater following corn then soybean or another legume, however know that spores that infect your wheat crop can arrive fromoutside the field. Please click to see more information on theTop 8 Recommendations for Winter Wheat Establishment in 2016. Variety selection matters. Data from our 2015 and 2016 WI Winter Wheat Performance Test shows variable yield and disease performance among the varieties listed. Select those varieties that have both good to excellent FHB (2015) and Stripe Rust (2016) resistance and high yield. When evaluating disease resistance, low numbers for both incidence and severity can be helpful, but the major focus should be placed on incidence (measure of the number of symptomatic plants in a stand). Application timing matters. One of the biggest challenges year in and year out is improper fungicide application timing. 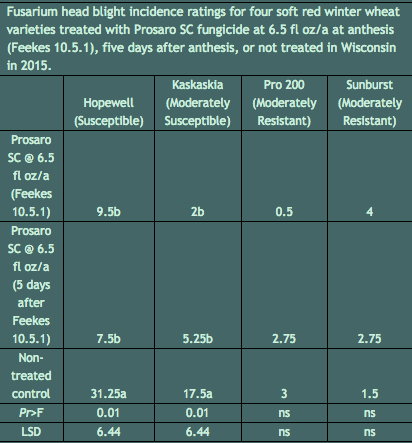 Our data suggests that on susceptible (Hopewell) or moderately susceptible varieties (Kaskaskia) equal efficacy of the fungicide Prosaro at a rate of 6.5 fl oz/acre can be achieved when applied between Feekes 10.5.1 (anthesis) and 5 days after anthesis. Given the variability of head emergence and anthesis across a landscape it may prove best to wait a few days until the whole field is flowering than to apply too soon.If the extruded anthers have turned from yellow to white across the whole field then you are likely too late. Remember it roughly takes a wheat head 7 days to completely self-pollinate. Choose the right fungicide class. Make sure you use the appropriate fungicide product and class to manage FHB. The label for products containing strobilurin active ingredients (FRAC group 11) ends prior to flowering. Late application can actually lead to increased mycotoxin levels. Triazole containing products (FRAC group 3) are recommended for FHB control. For a list of products and efficacy ratings, visit the Field Crops Fungicide Information Page. Harvest timing and flash drying. The word on the street is that if FHB appears to be a problem in 2017 elevators will push growers to harvest early (18% moisture or higher) and subsequently dry grain to mitigate mycotoxin levels. While drying grain to 13% or less moisture is a good storage practice, know this process may kill the pathogen but any mycotoxin levels already in the grain will not dissipate. Vomitoxin is a very stable molecule and IS NOT degraded by heat, freezing, or drying. Previous post: Question of the week: What is up with all of this white mold on soybeans?